...Total Unbiased Straightforward Information and Choice! Why choose an independent club technician service over one of the big box retail golf specialty stores? The operative word here is “independent”. The process of buying golf clubs is flawed when you go to a mega retailer, who is peddling large quantities of standardized, mass produced product to the unsuspecting public. The big box retailers owe allegiance to golf manufacturers through incentive, spiff, and sales promotion programs. They often try and steer the customer to one manufacturer or another. They even sell or up-sell new over used/refurbished clubs when it is not always necessary to achieve marked game improvement. Whichever company is offering their sales people a deal that month, is the one they tend to push at the time. And “trade-in” programs – forget it! You lose more value on a set of golf clubs in a trade-in than you do with an automobile. You are far better off to have a business like ours clean-up and prep the old clubs to sell on Ebay. A sales person at a well-known golf specialty retailer once told me the following. From the pure sales perspective, the entire golf marketplace is driven by addicted customers who have abandoned all hope, yet keep buying anyway. The average sales person could care less about your club performance once your credit card is processed. We offer choices! 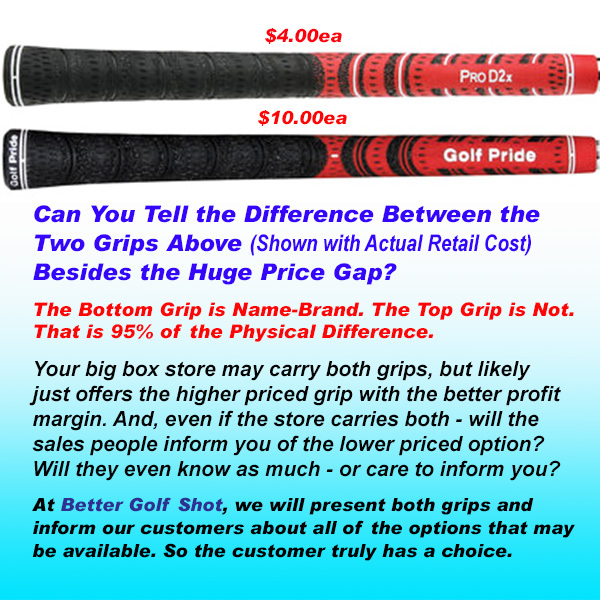 While you might find the most expensive brand grips at the big box retailers – you won’t find the more cost effective independent brands. But, we carry or can order a broad range of options and choices. We are truly unbiased and offer an objective viewpoint.We have no “brand loyalty”. Our success is not sales-driven. Our success is people-driven. If we can help our customers resolve needs, issues, problems, and frustration in the sport of golf – we’ll make them happy and improve their game. Hence, our business will grow in time. At Better Golf Shot, we work with all brands and types of clubs. No job is too small. New clubs, old clubs, used clubs bought from a store, Ebay, or garage sale. We’ll refurbish, re-build, provide new, or repair any club(s) or set. An independent club technician can do more specialized repair work, refurbishing, fitting, and custom club building over the big box and specialty golf retailers. Not to mention the ability to provide the customer with an unbiased opinion with no incentives one way or another except to assist the customer achieve his or her objectives on the golf course. The independents in general, also have a broader perspective of the offerings available in the marketplace including those products made by smaller manufacturers with good products overshadowed by the big marketing golf giants in the industry. The most important thing for every golfer looking to improve their game is to remember that the golf industry is driven by marketing, and marketing is not always truthful and accurate. Golf manufacturers pay large endorsement fees to the professional PGA players to achieve credibility and name recognition. It does not mean that it is the best equipment. The PGA Tour players all have club technicians on their staff payroll that work on their clubs and make adjustments. The bottom line is for you to do some basic research, and get properly fit. Acquire a set of custom golf clubs to help your game reach its fullest potential. Our training in fitting is thorough and complete with a huge edge over our larger competitors. We are here to act as your personal golf club technician – whether it is for one club or a whole set.